“The Men Who Tread on the Tiger’s Tail (1945)” movie review. Plot: A clumsy Porter (Kenichi Enomoto) realizes that the Priests he’s escorting through the mountains aren’t real priests, but are Samurai guarding an ousted Lord. He decides to help them peacefully get through the checkpoint so they could enter the city. If you’ve seen “The Men Who Tread On the Tiger’s Tail” and are reasonably familiar with my website, you might be wondering: “MartialHorror, why are you reviewing this? Last I checked, there aren’t any killer, fire-breathing, mutant zombie sushi who break out in musical numbers in this movie”. And you’d be correct, there aren’t any killer, fire-breathing, mutant zombie sushi who break out in musical numbers in this movie, but that is why “Dead Sushi” is vastly superior to “The Men Who Tread on the Tiger’s Tail”. So why am I reviewing it? I dunno. 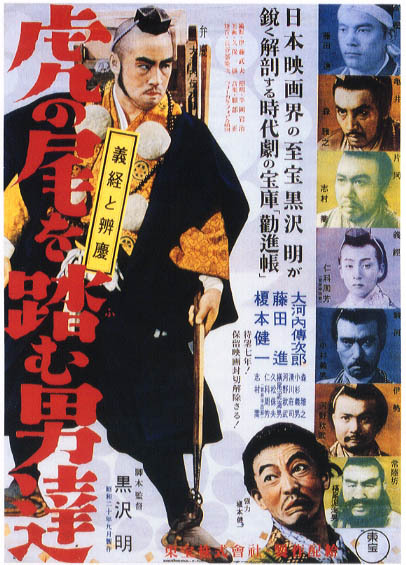 It’s an Akira Kurosawa feature that few people seem to know about and it’s technically a Samurai drama, even if I must stress the ‘drama’ part. There isn’t much- if any- swordplay, but I felt like reviewing it. 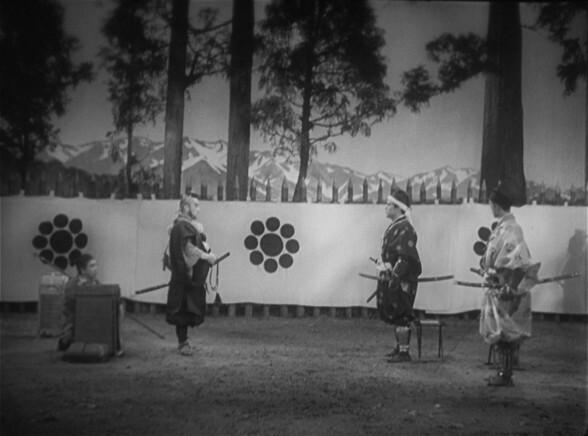 “The Men Who Tread on the Tiger’s Tail” is an interesting subversion of the Samurai genre, but it also shows that not everything Kurosawa touched turned into gold. It’s a decent film, but it lacks substantial material. “The Men Who Tread on the Tiger’s Tail” doesn’t contain much/any fighting because it is about the importance of avoiding combat in the story. If weapons clash, that would guarantee the samurai have failed their quest. Therefore, each scene is about characters using their minds to fight their enemies…although no, that doesn’t mean characters pull out their brains and start beating people over the head with them…That would make “The Men Who Tread on the Tiger’s Tail” too awesome for its own good. My problem is that the story has the tendency to lounge around, being too sluggish- or dare we say, drunk?- about moving forward. The first third of the film is men traveling, singing and bullying the porter. It also contains exposition as to what is going on. I’m not going to lie, I was pretty bored. The one shining light was that I found the porter to be surprisingly amusing, whereas most old fashioned comic relief characters tend to annoy me. It’s not that the film was bad, it just wasn’t offering me anything to become interested in. Things pick up when they reach the check-point, because now everything is on the line. The troupes leader, Benkei (Denjiro Okochi) has to prove to Togashi (Susumu Fujita)- who is in charge of the barrier- that he and his group are real Priests. What follows is a captivating game of wits between the two, as Togashi (respectfully) tries to throw Benkei off-guard and Benkai must maneuver around the mans tactics. I found their interactions to be compelling and suspenseful. Furthermore, the cinematography and editing are top notch. I loved the quick reaction shots of everyone else, as they nervously watch the exchange. This done does take up a large chunk of time. I’d presume it goes on for at least 20 minutes, maybe even longer, but it was perfectly paced. Unfortunately, after that scene is finished, it ends with the group getting drunk. We expect some sort of pay-off to this. Did Togashi see through their ploy after all and sent these men to trick them under the guise of providing alcohol. Then everyone starts goofing around and then…it just sort of ends. Maybe there is something more to this ending that I’m just not seeing, but I thought it was a piss poor resolution to the story and I’m not just saying that because “The Men Who Tread on the Tiger’s Tail” lacks a finale where Benkei fights a man with a fish for a head, who sexually harasses him and wields an axe. It felt like one of those endings where they just ran out of money. Regardless of the reason, I didn’t like it. Akira Kurosawa has done so many great movies that it might make “The Men Who Tread on the Tiger’s Tail” look worse because it pales when compared to his classics. When you’ve made iconic films such as “Rashomon”, “Throne of Blood”, “Seven Samurai”, “Ikiru”, “Ran”, “Drunken Angel”, “Kagemusha” and lesser known greats like “Stray Dog” and “Sanshiro Sugata”- “The Men Who Tread on the Tiger’s Tail” seems like generic fodder in comparison. So it’s not a bad movie, it’s just not a film worthy of the master. It lacks content and even though it’s an hour long, it tends to drag on. Still, it’s technical accomplishments were impressive for its day and it does have some strong moments. As a whole, I really liked the parts that worked, but was indifferent to the parts which failed. It’s not Kurosawa’s worst though, as at least this was better than “Sanshiro Sugata part II”. 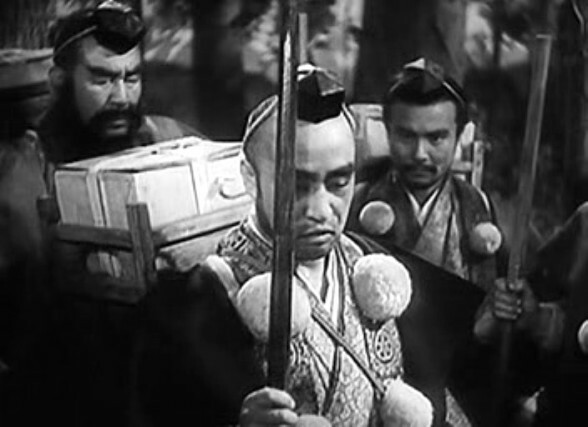 Overall: “The Men Who Tread on the Tiger’s Tail” is worth watching if you’re a Kurosawa completest. Otherwise, eh…it’s up to you. Not a bad samurai drama, but not a particularly memorable one either. “The Tale of Zatoichi (1962)” movie review. “Lady Snowblood (1973)” movie review.